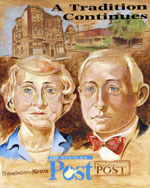 Greer industries started the West Virginia Newspaper Publishing Company, which purchased the Dominion Post, in 1923, according to The Dominion Post website. The Greer's grandson, David Raese, a co-owner and the publisher of The Dominion Post, provides more details about the newspaper's history. David Raese, co-owner and, publisher, tells how his grandparents, who were in the mining business, purchased both Morgantown’s Democratic and Republican-oriented newspapers in the 1930s and later merged them into The Dominion Post.